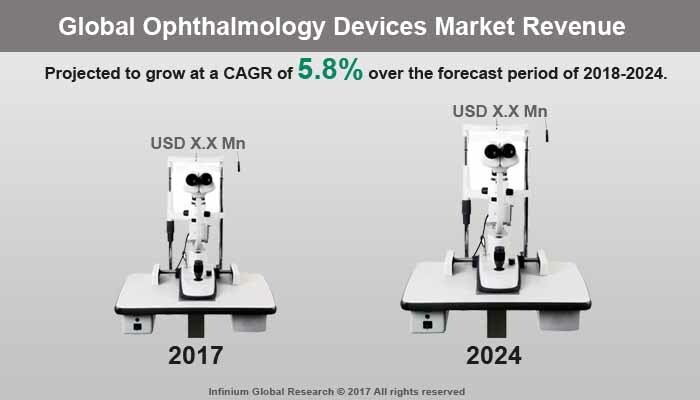 A recent report published by Infinium Global Research on ophthalmology devices market provides an in-depth analysis of segments and sub-segments in global as well as regional ophthalmology devices market. The study also highlights the impact of drivers, restraints and macro indicators on the global and regional ophthalmology devices market over the short term as well as long term. The report is a comprehensive presentation of trends, forecast and dollar values of global ophthalmology devices market. According to the report the global ophthalmology devices market is projected to grow at a CAGR of 5.8% over the forecast period of 2018-2024. Ophthalmology is a branch of medical sciences that deal with the medicine and surgery of the eye. The medical devices used in the identification and treatment of certain visual irregularities and deficiencies of the eyes is known as ophthalmic devices. The importance and adoption of these devices are increased owing to the high incidence of various ophthalmic diseases such as glaucoma, cataract, and other vision-related issues. Depending on product function and use, ophthalmic devices are categorized into surgical, diagnostic and vision care ophthalmic devices. The demand for ophthalmic devices is anticipated to be increasing significantly over the forecast period. The increasing application of developed technology and innovation in devices of ophthalmology has provided useful and economical solutions for various eye-related disorders such as refractor disorders, vitreoretinal disorders, and cataract to the customer. Chronic eye diseases are the main reason for vision loss. The increasing prevalence of eye diseases among the age group is likely to boost growth in the market. In 2017, WHO estimated that 253 million people live with vision impairment, 36 million are blind and 217 million have moderate to severe vision impairment. Growing adoption of contact lenses and spectacles and change in lifestyle are some other factor that will propel the growth of the market in the coming years. On the other hand, the cost of ophthalmology devices are high and the use of refurbished ophthalmic devices is increased thus hampering the growth of the market. In addition, lack of awareness about various eyes disease among the people will restrain the growth of the market. North America is expected to be the largest market for ophthalmology devices followed by Europe. There is intense competition between North America and Europe region. The presence of developed healthcare infrastructures coupled with growing geriatric population and rising incidence of chronic eye conditions are likely to boost the growth in this region. The Asia Pacific is expected to grow faster due to improvement in healthcare infrastructure, the growing occurrence of eye disorders such as glaucoma, and raising awareness among patients. Mergers & acquisitions, product launch, and geographical expansions to maintain market position are the key strategies of the leading players in this market. For instance, in 2016, Alcon, Inc. signed a partnership agreement with PowerVision, Inc., to focus on the development of fluid-based implants. The report on global ophthalmology devices market covers segments such as devices and application. On the basis of devices the global ophthalmology devices market is categorized into surgical devices, vision care, and diagnosis devices. On the basis of application the global ophthalmology devices market is categorized into optical retail centers, hospitals and ophthalmology clinics, and ASCS. The report provides regional analysis covering geographies such as North America, Europe, Asia-Pacific, and Rest of the World. In this section, the key trends and market size for each geography are provided over the period of 2016-2024. The countries covered in the North America region include the U.S., Canada, and Mexico; while Asia-Pacific includes China, Japan, India, South Korea, Malaysia, and among others. Moreover, Germany, U.K., France, Spain, and Rest of Europe are included in the European region. The U.S. drives the growth in the North America region as it is the largest market in the region. The Asia-pacific region offers substantial potential for the market growth owing to rapid growth in markets such as India and China. The APAC region is projected to experience growth at a CAGR of x.x% over the period of 2018-2024. The report provides profiles of the companies in the global ophthalmology devices market such as Carl Zeiss Meditec AG, Abbott Medical Optics, Inc., Bausch & Lomb, Inc., Alcon, Inc., Haag-Streit, Johnson & Johnson, Essilor International S.A, Nidek Co. Ltd, Topcon Corporation and Others. The report provides deep insights on demand forecasts, market trends, and micro and macro indicators. In addition, this report provides insights into the factors that are driving and restraining the global ophthalmology devices market. Moreover, IGR-Growth Matrix analysis given in the report brings insight into the investment areas that existing or new market players can consider. The report provides insights into the market using analytical tools such as Porter's five forces analysis and DRO analysis of ophthalmology devices market. Moreover, the study highlights current market trends and provides forecast from 2018-2024. We also have highlighted future trends in the ophthalmology devices market that will impact the demand during the forecast period. Moreover, the competitive analysis given in each regional market brings insight into the market share of the leading players. This report will help manufacturers, suppliers, and distributors of the ophthalmology devices market to understand the present and future trends in this market and formulate their strategies accordingly.